Most (if not all) Malaysians can relate to this. At some point of our lives, we will have the tendency to collect and keep some items at home out of habit, even when we don’t really need too many of them because it’s something that was taught by your grandparents, parents, uncle, aunty, neighbors, or even your friends. We always thought that there’ll be an occasion for us to use these items but over time, it only cause you to have clutters which you struggle to get rid of them. Do you have any of these items at home? Let’s find out together, shall we? Before the implementation of ‘No Plastic Day’ or ‘No Plastic Bags’, we literally kept all the shopping bags and plastic bags after our shopping trips. For plastic bags, we usually use it as a rubbish bag so that we don’t have to purposely spend money to buy rubbish bag since we’re going to discard them. Since the ‘No Plastic Bags’ campaign was implemented in Selangor, plastic bags were replaced with recycle bags, and so it begins another household collection of ours. Boxes or gift boxes can be found abundantly in almost every household especially after the festive season because we are suckers for beautiful packages. While we can’t really recycle them as gift box, we usually use it to store our biscuits and accessories. They also make good piggy banks for all our loose cash and coins! We usually get the plastic spoon or wooden chopsticks when we pack our food from restaurants or have it delivered to our doorsteps. However, if we are already having our food at home, we normal use our stainless steel cutlery sets. 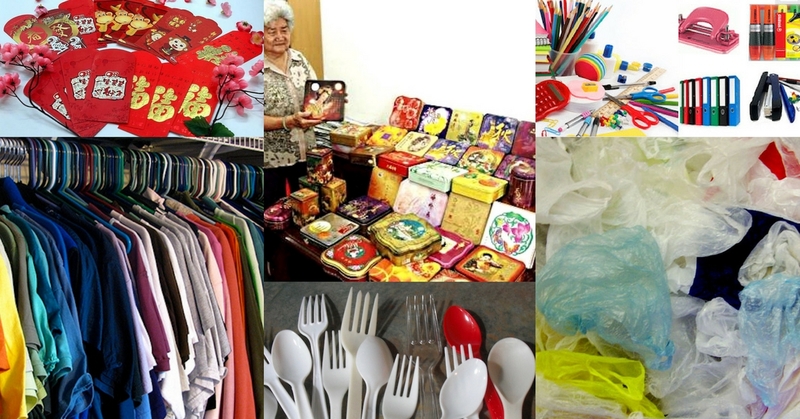 So naturally, the habit of collecting plastic spoon or wooden chopsticks start from here because we always thought that we’ll use it for home parties (which we’ll end up buying more plastic spoons when it happens anyway). Some simply stash this hidden in their drawer just so to keep the guilt for polluting Mother Nature. Which comes together with door gifts for expos, orientations, offices (yes to free attestations! ), and hotels. Why? We just want to bring back a piece of our vacation without needing to go to prison. Most importantly, there’s no such thing as having too many pens at home! This is a must-have item in every Chinese household. Most people don’t purposely buy their preferable design of red packets. They collect them from banks, supermarket, or boutique during the CNY season. Also, there’s always leftovers from the years before and we’ll feel like it very wasteful for us to throw unused ones away, which adds on to the pile of slow-moving inventory at home. Till this day, my mum still insists on keeping our baby clothes in our house. She took them out for a wash every once a while, and I remember her telling us that our clothes were way too expensive for her to discard, so she’s keeping them for her grandchildren! While this is one of the most common excuses from our moms,, some people keep their old clothes for various other reasons, like hopping that they can fit into their old jeans from 10 years back, or a trend that is tale as old as time. Are you guilty as charged? Let us know by leaving your comments down below!